Thomas and the Magic Railroad is an interesting one. 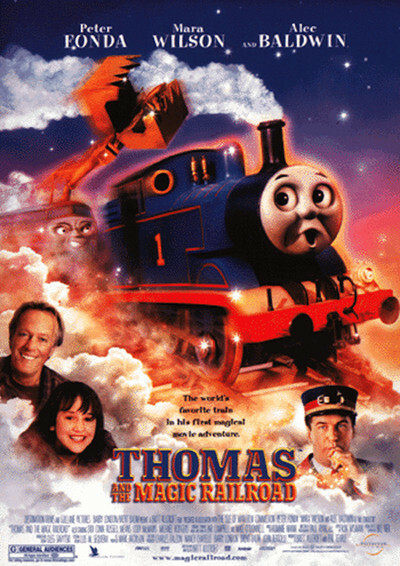 I remember getting it on VHS for Christmas in 2001, in a box set that included little plastic toys of main characters Thomas, Lady, and Diesel 10. As a kid, I was all over it - to see my childhood hero in a major live action film was overwhelming, and hearing all the engines talk with their own voices was equally impressive. In retrospect, however, it's nothing truly awful, but certainly not good. Despite being scripted and directed by series creator Britt Allcroft, the film Americanized the hell out of an iconic British series, adding gimmicky magical traits to what is simply an English railway with talking trains of various personalities, prone to constant accidents which likely causes declining attendance and gargantuan insurance costs. Well, I made that last bit up. Not the accidents, just the repercussions. But who knows, they could be true, if Thomas had politics involved in it's simplistic narrative. A common mistake many people have noticed - Thomas enters the magic railroad with Lily and sees the coal truck nearby on a neighbouring track. However, when Lady later travels down the same magic railroad, there is only one track. During the opening scene, an establishing shot shows all the engines hard at work at Knapford station. Amongst all the chit chat and ambience, one can hear James saying "Hello, Thomas! ", despite the fact that Thomas is nowhere to be seen. Even stranger, one can even hear Thomas replying with a greeting of his own. Oops. I get that there are restrictions when it comes to superimposing actors onto these model railway sets, but we can list this as a relevant error. Sodor seems to be completely devoid of humans, making any services the engines are carrying out, passenger or freight, completely pointless. We also face another issue with this lack of human presence - the engines still clearly need coal, water, and some way of having rolling stock coupled to them. With no people around, how is this possible? ANOTHER error we face is that when Lady is reborn, she requires Burnett Stone to operate her, whereas all the other engines can move freely by themselves. When Lady and Thomas pass under a bridge as Diesel 10 chases them, Thomas is smiling, despite them both being in mortal peril. Diesel 10 has a claw attached to his roof known as Pinchy. Pinchy is later used to hold Mr. Conductor hostage and Diesel 10 threatens to drop him off the viaduct if he does not give him the information he needs. In order to escape, Mr. Conductor severs one of Pinchy's hydraulic pipes, causing it to malfunction. Nicely done...but, afterwards, how did Pinchy get repaired? It is seen working just fine for the rest of the film, so perhaps there are hidden human mechanics on Sodor after all. Henry is feeling a bit under the weather, so Thomas promises to collect him his usual special coal to make him feel better. Henry originally needed special coal before his accident when pulling the Flying Kipper, but this was no longer the case after he was rebuilt at Crewe. And don't tell me this is set before or something, because Henry is in his rebuilt shape during the entire movie. When by the windmill with Lily, Mr. Conducter, and Thomas, Junior is swept away and lands on Diesel 10, who whisks him away to his potential demise. But this isn't like Mr. Conducter, where Diesel 10 had him trapped in Pinchy - Junior is just sat on top of Diesel 10 with no means of restraint. He could've easily jumped off without risk of injury, seeing as he was able to survive being shot into the air and crashing onto a speeding train. Why was James in the strangely positioned furnace? He was just parked in a siding doing absolutely nothing - not collecting freight or anything else. It seems rather strange that he'd suddenly go to what is evidently the scariest, most dangerous, and most-likely-to-have-an-accident place that Sodor has to offer. Diesel 10, a locomotive weighing at least 80 tons, can be supported by a single wooden sleeper when hanging off the broken viaduct, and can crash onto a small barge without remotely damaging it. 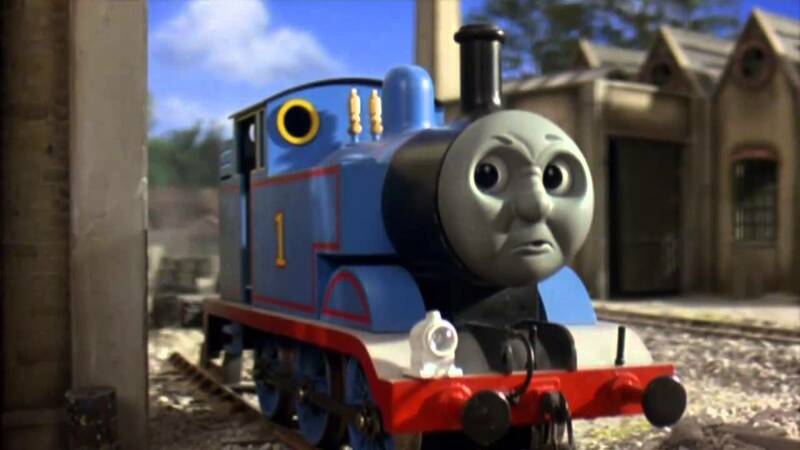 There is no way Diesel 10 would have difficulty catching up with Thomas or Lady during the final chase scene. Thomas and Lady are tank engines that, in real life, would reach a top speed of around 40mph. Diesel 10, on the other hand, is based on a BR Class 42, which could reach speeds of over 90mph. But why I am bringing facts into a children's movie with talking trains? Because I have nothing better to do when I'm not at work.